Extra gripping power you didn’t even know you needed. 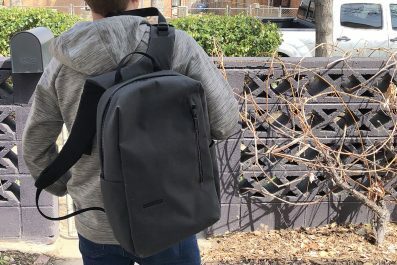 If you’re a gear junkie like me, then you probably have a lot of different gadgets and devices stored away in the closet or garage. 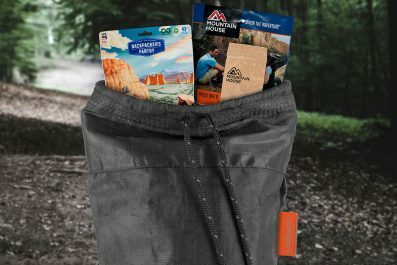 Of course when a camping trip or other outing comes up, I pack up all the gear I need out of this collection. At times, I expect it to get a little dusty or get a few beads of water on it, but I’m always careful with what I own. 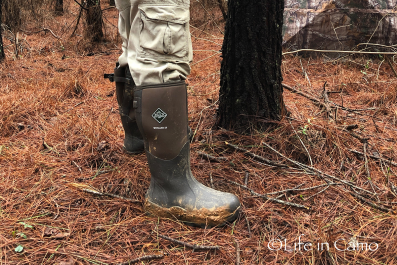 Some of these, like binoculars for example, have rubber armor and grip surfaces so I know they’ll perform even in wet conditions. Other items, like my digital camera, is a treasured item but a little slippery or hard to handle in some conditions. Up until now, I just assumed the device is what it is, as in there were no options to upgrade the grip surface. That is until I came upon Gear Gripz. They specialize in non-slip grip tape for a variety of uses, and you can easily place it on those slippery devices or items you need to keep under control no matter the circumstance. Let’s take a closer look at how Gear Gripz works and what you can use it on. To be fair, there are some items I would never consider putting grip tape on. My Vortex Razor HD Spotting Scope for example. I’m not going to kid around and say an item like Gear Gripz is best applied “everywhere.” I believe there is a matter of taste involved with applying grip tape to your gear. Common items or functional tools are absolutely a different matter. I believe an example use listed on the Gear Gripz website accurately illustrates this. A medical walker is shown on their site with Gear Gripz Grip Tape placed on the frame. Truly, no one is going to be concerned with the appearance of a medical walker as long as it is safe and functional. An expensive spotting scope, as I finish my point, is another matter. Even if you might be a little hesitant to place grip tape on some items, the possibilities for practical application are numerous. Honestly I think aside from the obvious items, you’d likely come up with more applications just having a few sheets around the house. Given the price point for this product, having a few spare sheets around is easy to accomplish. Each package comes with three grip tape sheets that cost $14.99. Gear Gripz comes in three patterns right now – dime, honeycomb and tread. Each pattern offers its own advantages. Dime is simple and easy to place on anything without worry of keeping edges even. Honeycomb is a bit more stylish than dime, and it offers maximum grip coverage given its design. Tread is more of a specialty pattern that is best used on circular objects like flashlights or hammers. The grit of the grip itself is effective even when wet, but its not abrasive by any means. I would argue the true magic in Gear Gripz is not the grip itself, but the adhesive used in the grip tape. 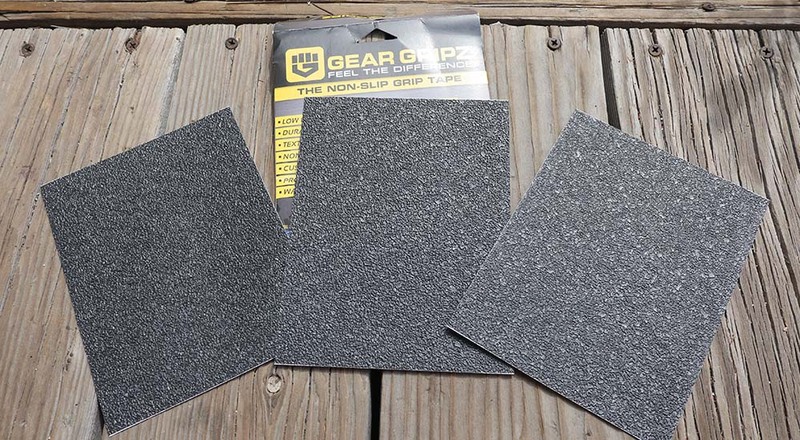 Gear Gripz calls it an “industrial adhesive,” and it is certainly is strong. Yet the true question with Gear Gripz is how does the industrial adhesive impact the item it is placed on long term? I was surprised to find that I can remove a grip tape section with a decent amount of pressure and my finger nail, but it doesn’t leave any sticky residue after it is removed. This may sound like a bad thing, but it’s actually perhaps the greatest strength of Gear Gripz. Through normal daily use, the grip tape easily stays in place and doesn’t peel up. Yet if you place it incorrectly, you can remove the grip tape section and start again. This provides a lot of flexibility that you normally don’t see in adhesive stickers. For my first test project with the Gear Gripz Grip Tape, I selected an item I know needs extra grip – my smartphone. 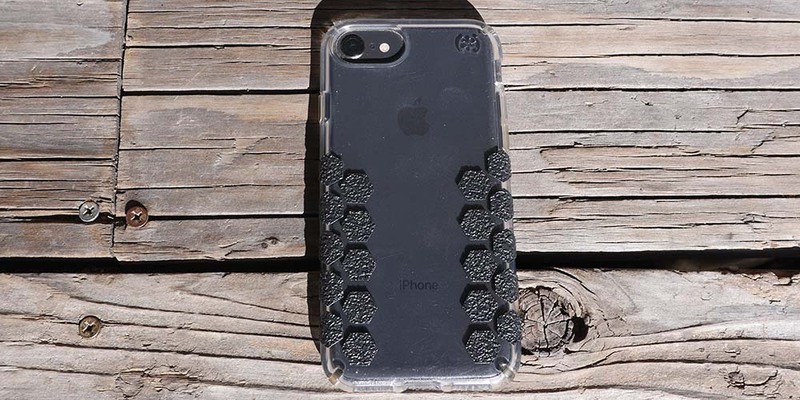 The reason I need extra grip is simple – the gentleman at the phone store sold me an item that in retrospect, I probably would not have purchased. This is because my phone case, while durable, is fairly slippery in my hand. 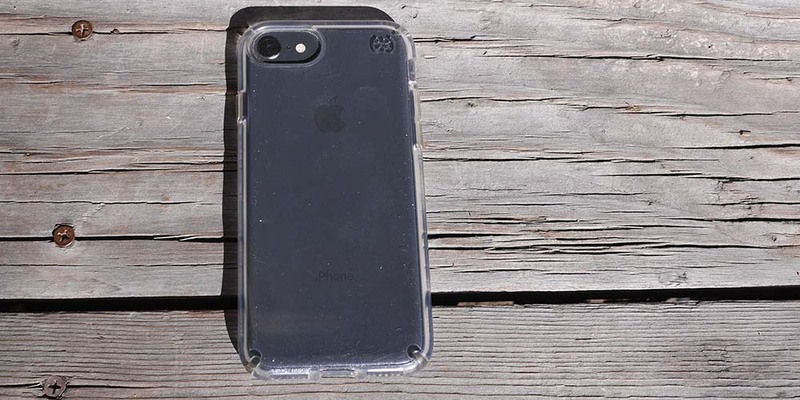 Seriously, who would design a slick plastic back to a phone case? But I digress. Again, I wanted to complete this project with taste. Randomly placing grip tape stickers all over my phone would look pretty tacky in my opinion. Instead I want a design that will fit with my phone, almost blend into the case. Fortunately, Gear Gripz is a product that can make this happen in two ways. Before placing some unknown adhesive or grip tape on a phone case I need for daily life, I decided to test it on an older phone case I had available. Should anything go wrong, no harm done. For this case I decided to do a “stick and peel” test, which involves peeling the back off a section of grip tape and peeling off the small dividers around the honeycomb pattern I was testing. While this process does require care (some of the honeycomb stickers want to peel off with the surrounding dividers), I was able to accomplish it fairly easily. It was at this time I also tested for adhesive residue, to which there was none. 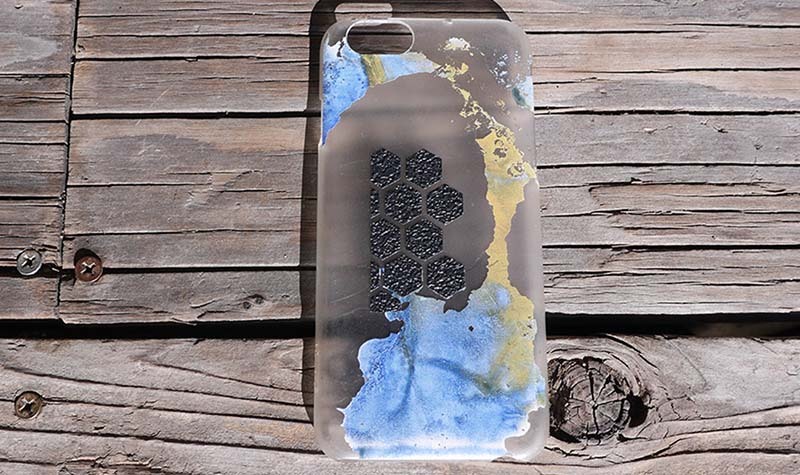 The phone case was painted with a design, and removing the adhesive also removed the paint. So a word of caution, Gear Gripz can remove some paint if taken off once placed firmly on a surface. After the more patterned test on an old phone case, I decided to try something free hand with a little more space between the honeycomb stickers. The challenge for the semi-perfectionist in me was ensuring all the honeycomb patterns would match up evenly. Using a guide and placing some temporary stickers, I was able to match up the honeycomb pattern to be mostly square across the case. From there it was just a matter of evenly spacing out the rest of the grip tape, and a basic pattern emerged on the edges of the case. I selected this area because it is usually the key points where I hold the phone, hence the areas where it could most slip. Surprisingly the install was easier to accomplish than I thought, and I was left pleased with the performance of the grip tape. Medical devices (walkers, canes, etc). Sports equipment (hockey sticks, weights, etc). Home fixtures (hand rails, stairs, etc). Gear Gripz Grip Tape is a quality product you probably didn’t think you needed, but it’s practical uses are near endless. I am most impressed with the fact you can place and remove it at will without any cleanup. I can’t say I recommend reusing the grip tape once placed, but as I mentioned, a $14.99 price makes this an easy resource to have for certain projects. Truly the only downside of Gear Gripz is the fact you can’t really see where the pattern ends and the surrounding borders or dividers begin. Even so, after bending the grip sheet, it’s not too hard to find the nearest grip section. 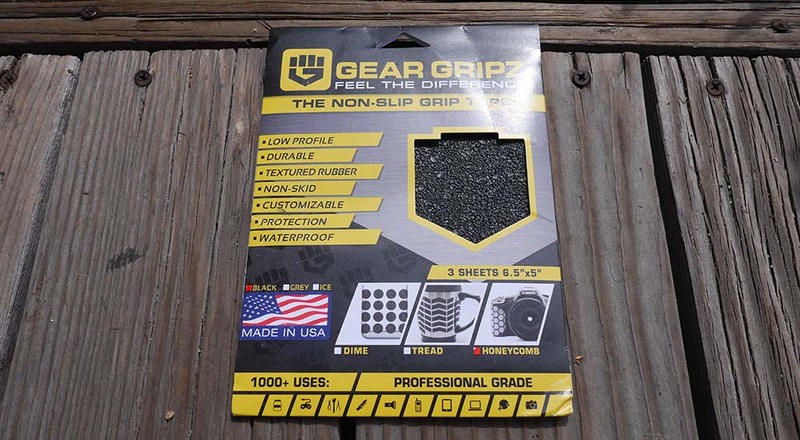 All told, Gear Gripz is an interesting product that solves gripping or slippage problems in an innovative way.